NMSU seniors Kyle Klingler and Simon Polakoff are referring to the state-of-the-art tools and equipment in the Aggie Innovation Space. Both are “Innovators” in the space – upperclassmen who serve as mentors and technicians for their junior peers. 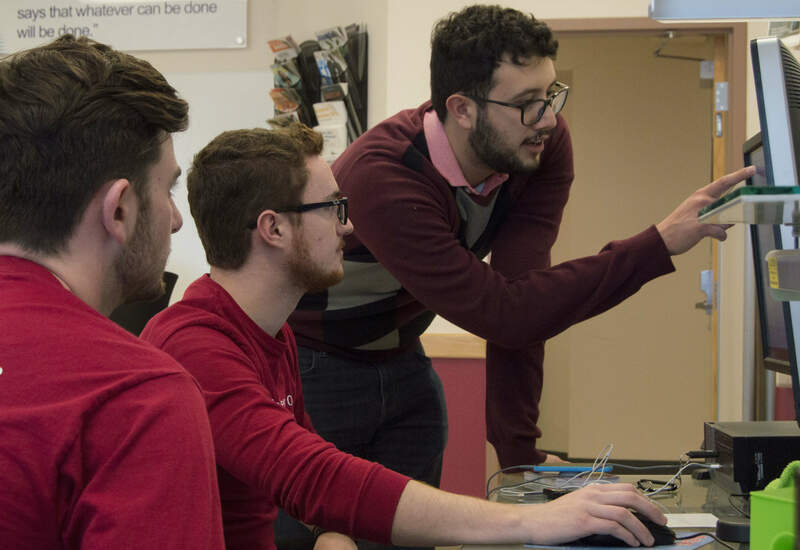 Shared experiences are what drive the College of Engineering’s Aggie Innovation Space. As the lab extension of the Eloy Torrez Family Learning Communities, the Innovation Space provides students an incubator where they can create and problem-solve among mentors, peers and faculty. It is a place where everyone shares a common goal and a common enthusiasm. “The sky’s the limit with the things we can do together in this space,” said Simon. Both Kyle and Simon believe their experiences have given them an edge over their peers from other institutions. We encourage you to help us keep NMSU’s engineering program a step above the rest by supporting the Aggie Innovation Space. Your gift today will help NMSU students like Kyle and Simon discover countless opportunities to find success in a positive, supportive and enthusiastic environment like no other. Your donation of $25 is an investment in our students and inspire us to innovate! Your donation of $50 is an investment in our students and inspire us to innovate! Your donation of $100 is an investment in our students and inspire us to innovate! Your donation of $250 is an investment in our students and inspire us to innovate! Your donation of $500 is an investment in our students and inspire us to innovate! Your donation of $1,000 is an investment in our students and inspire us to innovate!